Two weeks ago I ran a webinar under this title for Citrix. I’ve asked this question, or variations of it, many times over the past few years. The response from this group was quite similar to earlier ones except it was neater – the split was exactly 80:20 – 80% said that the learning experience had been while they were completing the task and 20% said it was in a classroom or workshop. Sometimes the response to this question has been more skewed towards the workplace (or in daily life – I ask people to include learning experiences that have occurred during childhood in their thinking). Rarely do more than 20% say their great learning experiences or AhAh! moments, occurred in a formal learning setting. Also rarely is the response of a group more skewed towards formal learning environments. 20% seems to be the maximum from any group – certainly in my experience. Although these samples are not random and the methodology may be suspect, the nature of people’s learning experiences is clear. Most of our significant learning occurs informally. Not only informally and in the workplace, but increasingly in the extended workplace as it increasingly becomes boundaryless. The extended workplace is certainly the ‘growth’ area for learning. As we become more connected in our daily lives we are also becoming more connected in our work. There has been huge interest in all things social and particularly in social learning over the past 2-3 years. My colleague, Jane Hart, maintains the most comprehensive social learning site at the Centre for Learning & Performance Technologies. It’s well worth a number of visits. Her ‘Social Learning Handbook’ is also a tremendous resource, as is Marcia Conner’s ‘New Social Learning’ book. They’re both practical and have lots of helpful advice for people thinking about the ‘how’ of piloting or rolling social learning into their suite of services. Mobile technology, too, is becoming a huge driver for worker education. The growth in mobile technology is phenomenal. The International Telecommunications Union (ITU) reported in 2010 that more than 70% of the world’s population had a mobile phone (with 5.3 billion mobile subscriptions by the end of 2010 – 3.8 billion in the developing world). Added to that statistic Sybase published a report in September 2010 suggesting that children (our next generation employees) are more likely to own a mobile telephone than a book (85% of children own phones compared with 73% who own books at home). Clark Quinn, another Internet Time Alliance colleague, has recently published an excellent practical book titled ‘Designing mLearning’. There is a free sample download available on the site, but it’s well worth getting hold of the entire book. Again, it contains plenty of practical advice on the right questions to ask and how to get your hands dirty and start out on building mobile learning solutions to support performance in the workplace. With all these changes there is no doubt that we’re leaving the simple ‘golden’ age of training where formal, structured development through a series of well-designed and planned training events sufficed as the only tool in the box. We’re moving from this early-20th Century approach and entering a much more complex world where learning professionals need to ‘think business’ and focus on the most efficient, effective and sustainable ways they can help their CEOs and Presidents rapidly build and maintain workforce performance improvement. This inevitably involves bringing learning into the workplace rather than bringing the workforce to learning venues. Work and learning are converging, there’s no doubt about it. If training and learning departments don’t understand this and respond by altering their practices and developing their services they will become increasingly irrelevant. Another issue I discussed in the Citrix webinar was learning maturity. ‘Maturity’ can mean a lot of things and there are some good learning maturity models but one simple way I look at assessing learning maturity in organisations is to determine the stage of development from a primary focus on ‘know what’ – the essential starting point for new hires or people moving to new roles – to a more sustained focus on ‘know who’ and ‘know how’. The latter two are where the cultural and sustained value of learning lies yet many Training and Learning departments have their prime focus hard-wired to the former. Many learning interventions are still formal, information-rich, interaction-poor and are essentially about trying to fill heads with facts that can be retained until they submit to the post-course assessment or certification exam. We know that filing heads with information and knowledge at task-level before the opportunity to practice the task or the need to use the information is quite pointless, but ‘content’ is still the driver for most learning. Learning maturity can also be demonstrated by an increasing de-focus on content and the provision of more opportunities to practice and to be exposed to experiential learning in context. Of course the ‘know who’ part is critical, too. We learn and work with and through others and we need to identify those ‘others’ who are best placed to help and work with us - both inside and outside our organisations. 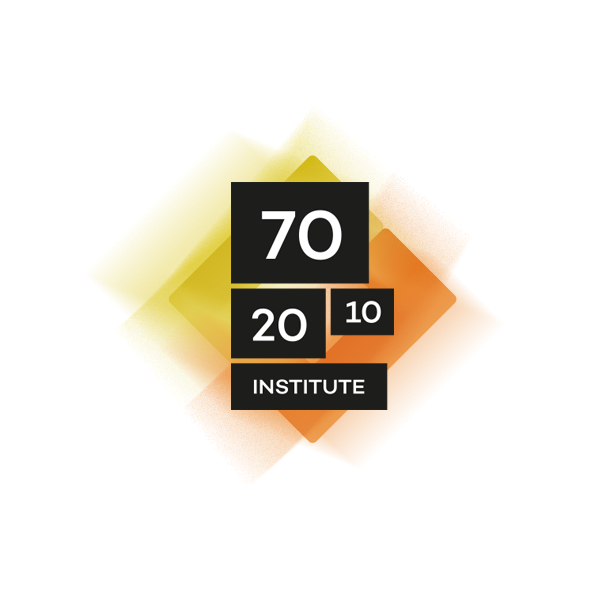 During the Citrix webinar I also looked at the 70:20:10 model as a mechanism for organisations to realign their learning focus and move up the maturity ladder. Most people have heard of the model – and it is only a reference model and not a recipe. It is based on survey and empirical data going back to the early 1970 (at least) that indicates working adults learn about 70% of what they need to know to do their job well in the workplace from experience and practice. They learn about 20% from others, through knowing who to ask, from informal coaching and mentoring and from effective networking and storytelling. They also learn about 10% of what they need from formal learning/training. When we talked about implementing learning strategies and practice using the 70:20:10 model in the Citrix webinar the challenges that were identified by participants were typical of those faced by many organisations. Response: This is an interesting question and one that points up the fact that we don’t live in an either/or world. Well-designed and run facilitated workshops are a good example of why models such as 70:20:10 are simply reference models and not intended to be used as tight recipes. In a well-run facilitated workshop there will be plenty of opportunity for peer learning, networking, peer mentoring and other ‘20’ activities as well as structured activities. There should also be plenty of opportunity for practice. Organisations such as Cranfield Management School work with client organisations to structure ‘formal’ 70:20:10 models of learning – where formal executive programmes are structured to provide roughly 70% of experiential learning and practice in the workplace; roughly 20% learning through others – action learning, peer-mentoring, workplace coaching etc; and roughly 10% formal classroom-based learning at the Management School. Response: Also a good question, and one often raised in ‘special pleading’ for the need to continue with formal, classroom-based learning for compliance and safety training. The point here is, if the objective is simply to provide ‘correct information’ I think most would agree that in the past the best, fastest and most thorough way was to send the information in written form – either on paper or electronically. Alternatively, I’ve seen very good eLearning modules work well in replacing formal classroom training. With written information there are fewer opportunities for misconceptions and misunderstandings, and less reliance of memory. Bringing people into a classroom and presenting information has always been probably the most inefficient and ineffective way we could possibly devise for compliance and safety training. If you want to see how one large corporation has demonstrated the positive impact of using ‘crowdsourcing’ and social learning techniques to help people develop skills in critical environments, have a look at this video of the British Telecom Dare2Share system or this Accenture paper on the approach. Dare2Share is an ‘internal Youtube’ where experts are encouraged to share their expertise –and they do. L&D plays a role in that there is a button beside every piece of content that can be clicked if it’s felt the content is either inaccurate or inappropriate. Peter Butler (former CLO at BT and now CLO at Lloyds Banking Group) tells me that the ‘inaccurate’ button has been pressed just a handful of times (certainly less than 10) and corrections, where required, made at almost Wikipedia-speed. The point here is ‘don’t fool yourself that simply providing the ‘correct’ information is the best way to change behaviour. Timely information and lessons learned from colleagues are both valuable. More to the point, learning professionals need to get to grips with the fact that colleagues often provide the best quality information to act. They bring practical experience of ‘knowledge in use’ and context to the party. There’s plenty of evidence that crowdsourcing from practitioners in the field will provide high quality information and insights and that, like Wikipedia, ‘incorrect’ information is quickly identified, filtered and corrected. 6. “Is the implication that we need more emphasis on developing the coaching skills of line managers and co-workers? Maybe readers of this blog might like to address some of these questions and share their experiences.